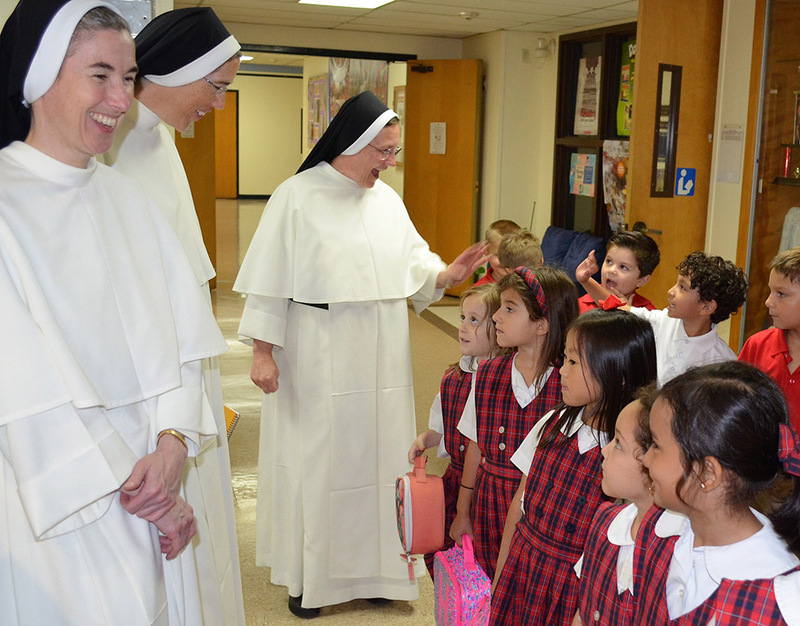 Dominican sisters visit with Mary Immaculate Catholic School students after an announcement that members of the women’s religious order have accepted an offer to teach at the Farmers Branch campus beginning next year. Two Dominican nuns will join the faculty of Mary Immaculate Catholic School in Farmers Branch next fall, adding to the number of women religious already teaching in Diocese of Dallas Catholic schools. The Dominican Sisters of St. Cecilia, who wear white habits and black veils, are also known as the “Nashville Dominicans.” Several visited Mary Immaculate Catholic School in the fall of 2018 and accepted the offer from the Diocese of Dallas to teach at the school. “During our visit to Mary Immaculate School,” Mother Anna Grace said, “the sisters and I were not only warmly welcomed by the faculty, staff, and students, but also impressed by the joyful and faith-filled atmosphere of the school. Bishop Edward J. Burns sent the invitation to the Dominicans in February 2018 and the sisters officially accepted in October of 2018. Father Michael Forge, the longtime pastor of Mary Immaculate Catholic Church, said two yet unnamed Dominican sisters will serve as a principal and a teacher at Mary Immaculate next year. He said the women religious will have much to offer the school and the larger Diocese of Dallas community. Several Dominicans currently teach at the University of Dallas in Irving. Father Forge is not new to an education with women religious. In 5th and 6th grades, he attended Divine Redeemer Catholic School in Colorado Springs, Colorado and witnessed the impact of the sisters on the school. The Dominican sisters will join about 12 other women religious currently teaching at Catholic elementary, middle school and high schools in the diocese, officials in the Catholic Schools office said. Matt Vereecke, the superintendent of Catholic Schools for the Diocese of Dallas, said that the importance of women religious in Catholic schools across the country could never be overstated. “They worked for free and built these institutions on their backs and, in the process, created the largest private school system in the world and positively impacted generation after generation of Catholics,” Vereecke said. He said that the Dominican sisters receive requests annually to teach at Catholic schools across the country, but that they are unable to fulfill many of those requests. “Dallas was selected largely because of the involvement of Father Forge and Bishop Burns, who both worked closely to provide an invite and a reception that was hard to turn down,” said Vereecke, who worked with Benedictine sisters at his former job as director of Monte Cassino Catholic School, located on the Benedictine Sisters of St. Joseph Monastery in Tulsa, Oklahoma. Collette and Mike Murray have two girls in seventh and second grades and next year, their son will be enrolled in kindergarten at Mary Immaculate. They said they are looking forward to the formation that the sisters will be able to give not only to the students, but also to the larger parish community.